Developer Quote: "Download our FREE app and tap into our more than 50 years of tax experience — no matter where you go!" - Check the status of your Federal refund. 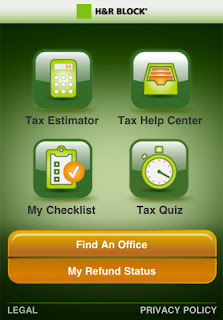 - Get instant answers to the most popular questions being asked by tax filers just like you! - Create a customized checklist. Whether you're completing your taxes in an office or doing them yourself, we will help you figure out what you need, and will keep you informed of important dates pertaining to your personal tax situation. - Quickly estimate your tax refund with our in-app Tax Estimator. - Stay informed of things that could impact your tax situation with our Video Gallery and News & Updates feature. - Test your tax know-how with our interactive quiz. What will you score? - Access hundreds of tax terms with our A-Z Glossary. - Find an office - use GPS or your ZIP code to find an H&R Block office near you. The tax refund estimator is a nice tool as you can quickly see if you will be able to purchase that new car after all, or conversely if you had better cut down on those shopping expeditions! The checklist helps you efficiently gather your paperwork to streamline the process. COOL CONCLUSION: "Tax Central does not do your taxes for you, but it sheds light on many important facets of this annual ritual and makes your task that much simpler."